Sirenoid is a mermaid-like Bakugan wielding a magical lyre to soothe souls. Sirenoid creates a forceful wave to boost its power and destroy its opponents. It uses its dolphin-like tail for speed and mobility. 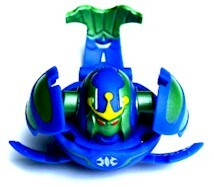 Sirenoid is Claus' guardian Bakugan. Purchase Sirenoid from Amazon now!